NEW YORK (CNNMoney) -- Investors around the world were rattled Friday after a massive earthquake and tsunami struck Japan, adding another layer of uncertainty to markets that were already jittery about oil prices and the volatile political situation in the Middle East. 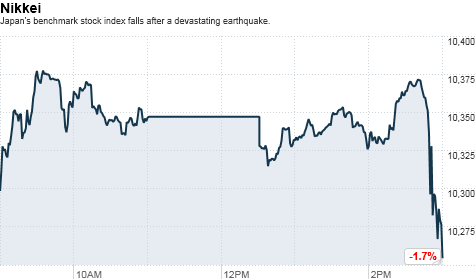 Asian markets, which were falling before the tsunami hit, ended sharply lower. Japan's benchmark Nikkei index declined 1.7%. Stocks in the United States were up slightly after a sharp selloff in the previous session. The Dow Jones industrial average was up about 35 points. European markets were under pressure, with stocks in London, Frankfurt and Paris all down less than 1%. "For now, the market impact has been limited," said Julian Jessop, an economist at Capital Economics. While the human and economic toll from the Japan devastation could be significant, economists said it is far too early to speculate about the long-term consequences. "At this stage the size and direction of these market moves all make sense," said Jessop. "It may be several days before the costs of the disaster are clearer." Still, investors were flocking to the Japanese yen amid speculation that the currency will be repatriated to cover costs of reconstruction. In addition, Nikkei stock futures, which reflect traders' outlook for the index, were down 300 points on the Chicago Mercantile Exchange. Investors were shying away from risky assets such as crude oil. The dollar, considered a safe haven by global investors, rose sharply against the euro and the U.K. pound. The most powerful earthquake to hit Japan in at least 100 years unleashed walls of water that caused widespread damage. Japanese media were reporting hundreds of people dead and hundreds more missing, and there is no word as yet on casualties in the hardest hit areas of the island nation. The U.S. National Weather Service issued a tsunami warning for at least 50 countries and territories. Tsunami waves have already hit Hawaii and California is bracing for residual waves, although damage is not expected to be severe. Japan was hit by a 7.3-magnitude earthquake in 1995, which had a "significant negative effect" on the nation's economy, said analysts at Nomura Securities. Over the long run, however, the economic impact of that earthquake was "limited," they said. Japan's economy still posted modest growth in the months after the 1995 earthquake, Jessop notes. But economic activity in Japan has been losing momentum recently, and the nation may be forced to pay for reconstruction by borrowing more money, he warned. "The greater the social and economic damage, the more difficult it will be for the government to ward off a fiscal crisis," said Jessop. Still, how the disaster will affect the Japanese and world economy is impossible to know, said economists, including Jessop. "There is no way to assess even the direct damage to Japan's economy, or to the global economy, that this will cause," said Carl Weinberg, chief economist at High Frequency Economics. Nevertheless, "experience tells us that the economic shock can be, and likely will be, much bigger than anyone can imagine," said Weinberg. -- The CNN Wire Service contributed to this report.